With breathtaking scenery and some of the most awe-inspiring climbing sequences ever captured on film, K2 takes you to the edge of the world - and into the face of sheer adventure. Despite being complete opposites, Taylor (Michael Biehn) and Harold (Matt Craven) are firm friends who share an intense passion for mountain climbing. 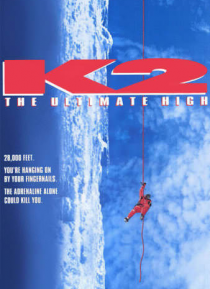 But when they jump at the chance for the ultimate adventure - scalin… g K2, the second highest mountain on Earth - Taylor and Harold find themselves battling for their lives. Known for being one of the deadliest climbs in the world, the duo must hold on for dear life as they try to beat the odds and conquer the summit. . . before it conquers them.